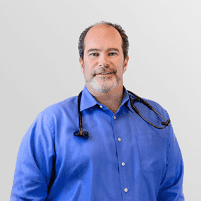 As an internal medicine physician, Michael Temkin, DO treats patients throughout their lives, from late teen years through old age, and has the pleasure of caring for many families at his practice in San Ramon, California. He views each patient as a whole person, not a collection of symptoms, and treats everyone with a compassionate, individualized approach to care. What conditions does an internal medicine physician treat? What should I expect from my primary care visits with Dr. Temkin? Primary care is vitally important in your journey to optimal health. As your primary care provider, Dr. Temkin provides guidance and support for current health issues and offers advice for preventing future illness. He addresses all of your healthcare needs by prioritizing prevention, coordinating additional care when necessary, and providing clear insight and guidance so you are able to take control of your own health. Whether you're in good health, suffer from a chronic condition, or require treatment for a minor sickness, Dr. Temkin is your partner in regaining and maintaining long-term wellness. At his state-of-the-art primary care facility, he delivers high-quality care that his patients trust. How is Dr. Temkin's care unique? Dr. Temkin has a holistic treatment philosophy, which means he sees patients as whole persons, not just as symptoms or diseases. He takes the time to get to know each patient's story and ensures that all questions are answered during each visit. Together, you and Dr. Temkin will devise a custom plan to fit your unique lifestyle and needs, getting you on the right track toward optimal wellness. He’ll empower you to make positive changes to your lifestyle and offer you the knowledge and support you need to take control of your health and prevent illness and injury. How often should I see Dr. Temkin? Dr. Temkin encourages his patients to stay healthy by coming in for annual checkups and recommended screenings, in addition to any visits for acute medical problems. He seeks to know each patient personally, understand their history and risk factors in detail, and provide individualized care and effective advice. Will my primary care visit with Dr. Temkin be covered by insurance? Here are a few of our accepted insurance plans. Please note that this is not a complete list of our contracted insurance carriers. If your provider is not listed, please contact us. We also encourage you to contact your insurance carrier to confirm coverage.